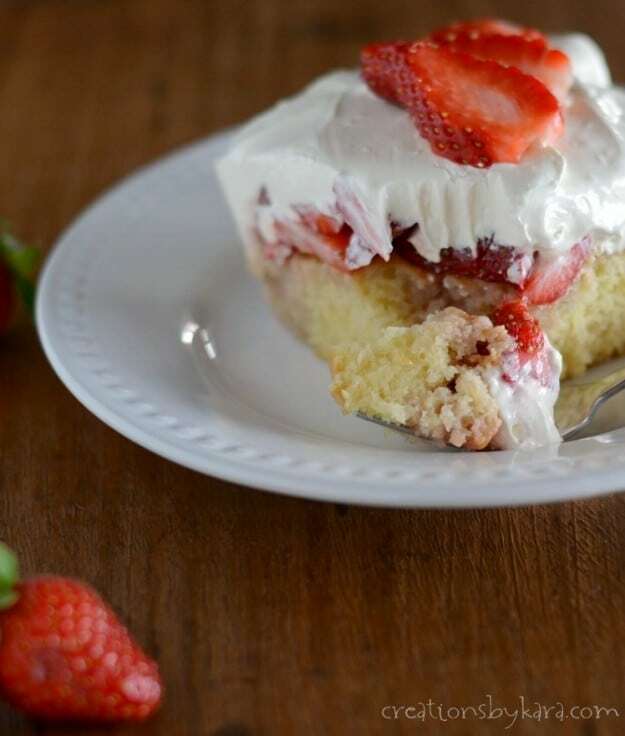 Blue Ribbon Strawberry Cake- Cool and refreshing, this cake is a perfect summer treat. And no one needs to know it starts with a cake mix! I was at the store last night and saw that quarts of strawberries were on sale for 98¢. Woohoo! I love strawberries, so I grabbed two boxes. I came straight home and started looking for a fun dessert that I could try. I discovered this one in an old notebook. I think it originally came from a cooking segment on my local news station a few years back. It looked super easy, and I love anything with sweetened condensed milk, so I decided to give it a try. Oh my. New family favorite! The sauce on top of the cake is to die for! The original recipe didn’t call for lemon juice, I added that. It takes away some of the sweetness and makes it taste a little like cheesecake. Heavenly. I used my extra strawberries to scrape the last traces out of the bowl. If I wouldn’t have had strawberries, I would have just used my finger and licked the bowl clean. It was that good. Plus the cake turns out nice and moist because of the juices from the strawberries. I love that it is served chilled, because it was so refreshing on a hot night. Love, love, love this cake! 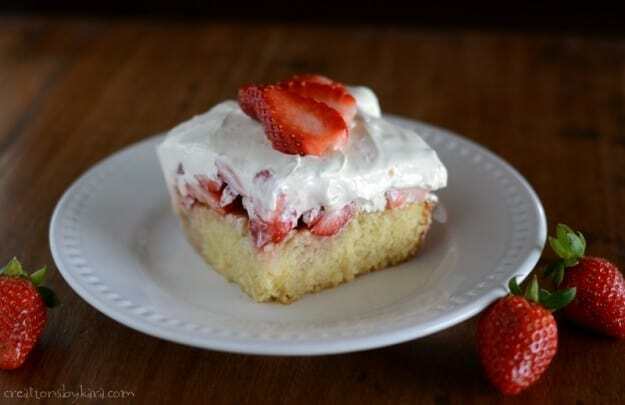 Yellow cake topped with fresh strawberries and a rich creamy topping. Bake cake in a 9x13" pan according to package directions. 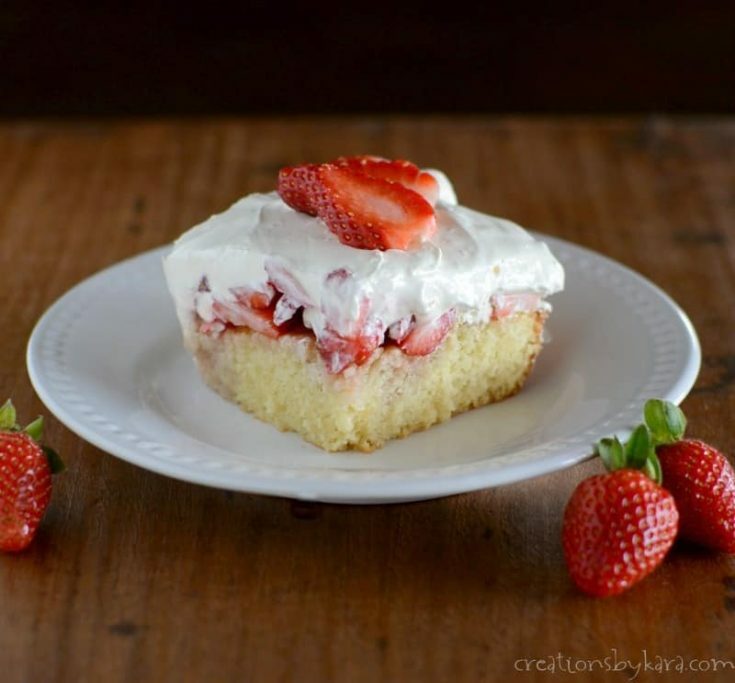 Punch holes in cake with a fork or skewer. Combine berries and sugar in a small bowl. Let sit for about 10 minutes till juicy. Spread evenly over warm cake. Cool completely on a wire rack. Beat Cool Whip, sweetened condensed milk, and lemon juice in a medium bowl. Spread on top of strawberries. Chill for at least 2 hours before serving. Garnish with extra strawberries if desired. Is this recipe for a sheet cake or round cakes? I made it in a 9×13″ cake pan. This cake looks so good Kara! 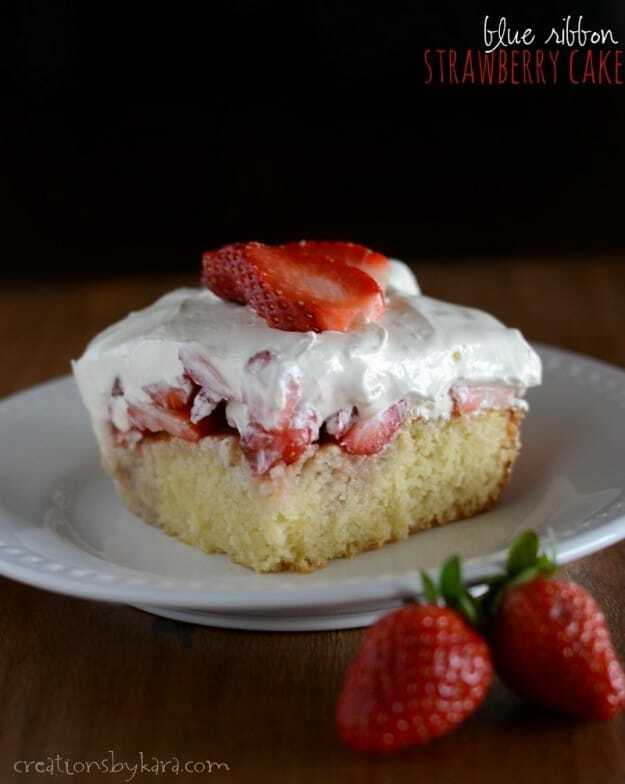 I just love that its strawberry season and this sauce sounds so good with sweetened condensed milk. Mmmm! Yes it is good. In fact, I wouldn’t mind eating it by the spoonful! What do u do with the 2 tbsp of lemon?…mix it with the cake mix or what? From the paragraphs before the recipe, I believe it’s in the “frosting” on top. Sounds and looks delicious! I think I will have to try it. So sorry, I forgot to mention that in the instructions. It’s fixed now! Cheryl was right, it goes in the frosting.